On the hunt for an SUV that is sleek, sporty, and prepared for whatever the road brings? If so, you’ve come to the right place. Here at Manly Honda in Santa Rosa, CA, we stock the all-new 2019 Honda HR-V in a wide variety of trims and colors to suit your preferences. This Crossover SUV offers a fresh, bold exterior with comfortable, spacious interior features that you’ll absolutely enjoy. For more information on our new Honda vehicles, we invite you to visit us at Manly Honda near Petaluma! As a full-service dealership, we employ specialists in sales, financing, service and parts that will go above and beyond to exceed your expectations. Take your rides to the next level in the 2019 Honda HR-V Crossover SUV. With the 1.8 L, 4-cylinder engine, 2WD drivetrain with a CVT and an electric parking brake that engages with the push of a button, drivers and passengers alike will enjoy a smooth ride with amazing performance. Whether you’re in search of used cars for sale, a new vehicle, or looking to upgrade, we can support you in your effort to find exactly what you’re looking for through our vast new and used dealership options. The new 2019 Honda HR-V has amazing safety features that add to its overall appeal. The driver-assistive technologies integrated into this model convert this vehicle into a safety suite for drivers and passengers alike. The Honda Sensing® system is designed to alert you to details sometimes overlooked by many drivers on the road, like getting too close to another vehicle or switching lanes when there is a car in your blind spot. Visit our Honda dealership today to experience the Honda HR-V for yourself and explore its advanced safety technology. We are sure you’ll love the sleek, sporty attitude of the new Honda HR-V. A neat feature about this vehicle is that the inside can be configured to suit your needs. It is designed with a 60/40 split Magic Seat® in the second row that can easily be folded down one side or the other for more cargo-carrying space for your luggage or gear. 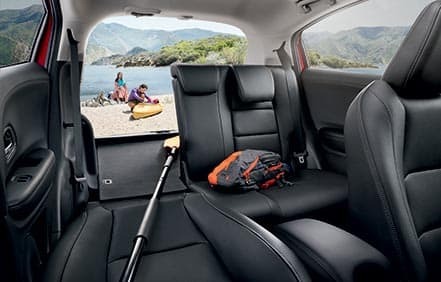 If you’re transporting long items, the passenger side front and rear seats fold down to accommodate items up to 8 feet long. Our new Hondas for sale allow you to enjoy all your exciting adventures in a stress-free way. Come see us to browse through our Hondas and take the 2019 HR-V for a spin. Innovation truly meets versatility with the 2019 Honda HR-V. With aspects from increased visibility brought forward by the interior illumination features to the multi-angle rearview camera, you’ll have zero problems checking your surroundings and being hyper-aware. Moreover, the Honda LaneWatch™ system makes it easy to switch lanes by displaying the passenger side roadway on the display touch-screen when you signal right. Pair this with the built-in navigation system and you’ll never get lost in this ride. As a popular option in our new car inventory, the new 2019 Honda HR-V is truly a steal, so don’t hesitate to schedule your test drive with us today!